Product information "Zomo S4 Plus NSE - Flightcase NI S4 MKII"
The Zomo S4 Plus NSE (NSE = NIGHT STYLE EDITION) is a robust multi-function flightcase. This exceptional concept of Zomo is specifically designed for the Native Instruments S4 MKI / MKII DJ Controller and it allows users to arrange their equipment in a confined space whilst offering guaranteed safe, secure transportation without any problems. 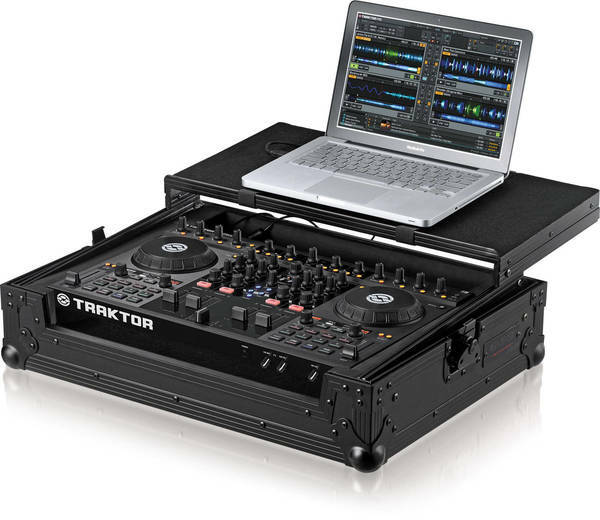 The S4 Plus NSE is a compact DJ Flightcase with a extra movable laptop shelf that can easily be pulled out. Its clever design will make it simple for you to arrange your workspace in just a few seconds. The casing is made of high quality 9mm laminated plywood. That makes the S4 Plus NSE very stable. Furthermore, the black-painted aluminum profiles and rounded edges stabilize the case. The Zomo Flightcase is extremely flexible, robust and provides superior protection against transit damage for valuable DJ equipment. ** The illustrated or mentioned devices are not included. Those are available separately in our shop. Customer ratings for "Zomo S4 Plus NSE - Flightcase NI S4 MKII"